The Navitas Education Group is one of the largest global academic institutes offering graduate programs. The Navitas Institute offers students a variety of options from courses, study periods, to study locations, linked to top universities in Australia, USA, UK, Canada. and Singapore. Every year thousands of international students choose Navitas transition programs as the best option for their start. 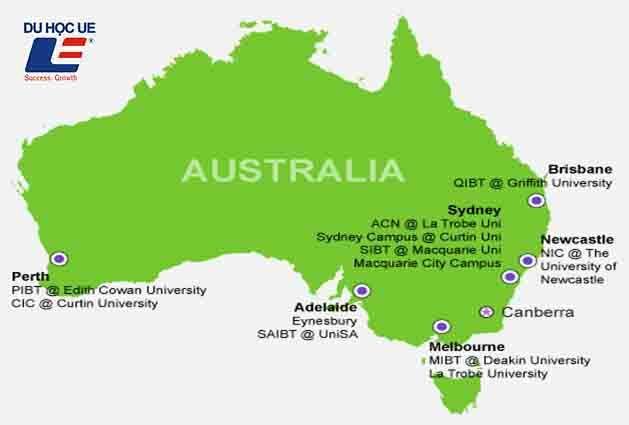 The Navitas Australia system is based in Brisbane, Sydney, Melbourne, Adelaide, Perth and offers high school, pre-university, college (postgraduate) and postgraduate programs. Pre-Master) for local and international students. Upon successful completion of the Diploma in Navitas, qualified students are guaranteed a direct second year of Navitas Australia, UK and Canada. Students can choose from 3 semesters (12 months) or 2 semesters (8 months) to shorten their study time. Flexible admission schedule: The program is open three times a year (February, June and October) so students can choose the most suitable admission schedule. Quality education guaranteed. The class is designed in groups with a much smaller number of students than in the university, with an average of only 40 students and is supplemented with group lessons and discussions with teachers. The sessions last longer, 4 hours instead of 3 hours. More access during school hours allows students to fully develop their knowledge and knowledge after each course. Student welfare benefits: academic counseling, personal counseling, housing, airport pickup, employment counseling, etc. Live in the city of development, safe, civilized and ideal learning environment. Navitas is currently offering great value scholarships to students enrolled in pre-university courses, Diplomas at Navitas Academy in Australia, UK and Canada. Navitas Australia is one of the UE school partners to participate in the "USA, Canada, Australia and other countries Education Fair 2018 " Organized by UE Corp. and ISN. There will be many interesting and useful information about the scholarship program for you.